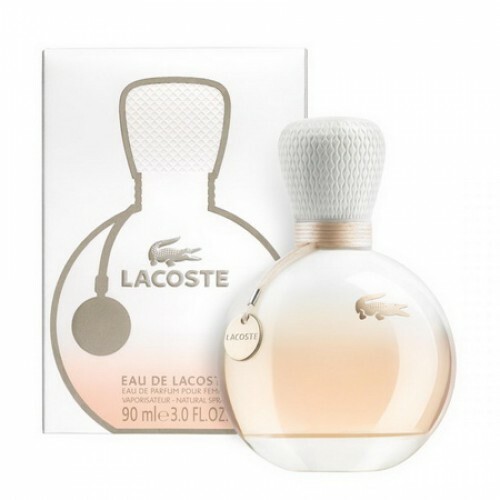 Eau De Lacoste Pour Femme is a very memorable flavor with a gentle, pleasant composition. Eau De Lacoste Pour Femme 90ml. Eau De Parfum - it is incredibly seductive and feminine fragrance. The composition of the eau de parfum is built on a delicate floral notes and flavors of ripe fruit. The girl who becomes the owner of this "tenderness" in the vial will feel instantly like around her miracles begin to happen. Fragrant notes perfume Lacoste Eau De Lacoste Pour Femme perfectly complement the best features romantic feminine soul. Vial combining light playfulness, which is inherent in youth, tenderness and affection that scree you like the petals of spring flowers. Light wood chords and smell southern vetiver bring in their flavor composition. Perfume Lacoste Eau De Lacoste Pour Femme for those girls who know that tenderness and femininity are not weakness, but rather serve as secret trump card for the conquest of the world and important heights ... or at least a handsome man. Release Date : 2013 Country - producer : France Gender : Female Classification fragrance : floral, fruity Top notes: pineapple, mandarin and bergamot note " heart ": sambac jasmine, orange blossom and leaf pineapple final note : vanilla, sandalwood, peru balsam and vetiver. created for charismatic and charming women. Perfume belongs to a group of floral scents. It was released just recently, the French fashion house Lacoste in 2013. Perfume is ideal for use at any time, at any time and for any occasions. Aroma turned refined, gentle, slightly simple, unobtrusive, elegant and enchanting. It will be enjoyed by every woman. Composition perfume Lacoste Eau de Lacoste enough multifaceted and complex, and it begins with the sound of his top notes of white pineapple and mandarin. In the heart notes of jasmine gentle sounds. And completing the sounding chords vanilla.